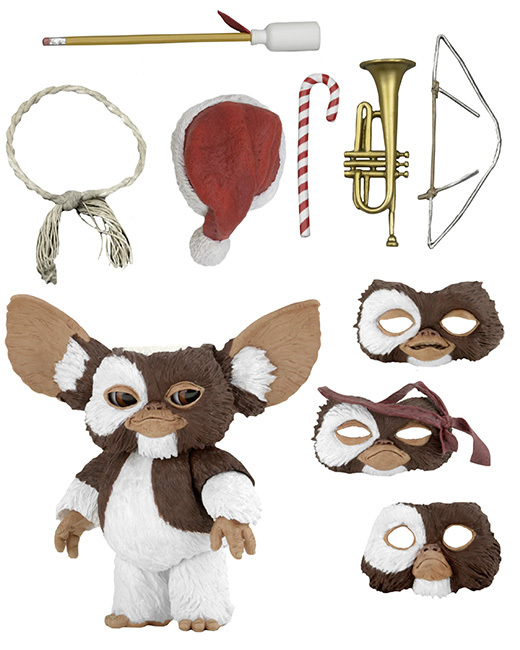 It’s Gizmo’s first appearance in our Ultimate line! Any fans of the Gremlins movies knows the rules: keep them out of sunlight, don’t get them wet, and never feed them after midnight. Follow them and you’ll have a cute and friendly little Mogwai, like this deluxe 7” scale Gizmo. He’s fully poseable, including ears and eyes (a small ball carefully concealed on the back of the head allows you to move the pupils in all directions to create many different expressions). Plus, Gizmo comes with four swappable faces so you can customize his expression! This Ultimate edition comes with Santa hat, trumpet, bow, pencil arrow and more. Packaged in a collector-friendly window box with opening flap.